I want to start this essay by stating that I feel it's very important for Buddhism to adapt, to a degree, to Western culture. To not adapt would be tantamount to hypocritically contradicting Buddhism's views toward, and use of, skillful means in conveying its teachings. I will return to this point later. In terms of our Sunday schedule, I don't know the Korean custom for lay services. That being said, I think this is one of those areas in which cultural adaptation is so important. In Journey to Mindfulness, Bhante Gunaratana explains that in the rural Sri Lankan village in which he grew up, the villagers visited their Theravada Buddhist temple daily. He wrote about how he woke each morning to his parents changing sutras in Pali. Again, this is Sri Lanka, not Korea, and a Theravada sect, not a Mahayana Zen sect, but in our society, very few people--sadly--have that kind of devotion to their religion. People in my culture are not, generally speaking, willing to sacrifice many of the things they love to follow such a time-consuming devotional routine. That does not mean, however, that we cannot benefit greatly from Buddhist teachings. Actually, I think it is imperative for the health of our culture to embrace practices such as those contained in Buddhism--our lives tend to be so hectic and over-scheduled that mindful meditation and a focus on developing compassion for all others is a vital necessity. Given the work schedule of our culture, it is convenient to schedule group services for Sunday, as we have done. 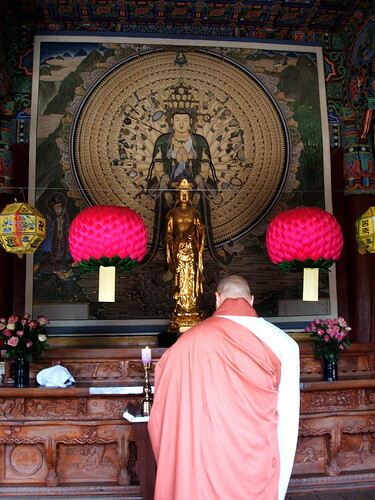 While I cannot verify whether there are Zen services in Korea on Sundays, I can confirm that the activities in which we engage at the services--reciting the refuges, chanting, and meditation--are primary practices in all Korean Zen temples. Additionally, many of our chants are actually in Korean (with English translations available for our study, of course). For those who are more dedicated to their practice, we have twice-weekly membership sittings. These include additional practices performed in Korean Zen temples, including prostrations, additional chants, walking and seated meditation, and interviews. For the truly devoted, my temple has designated times for congregants to come for work practice. Plus, as is common among Korean temples (and I'd imagine most other temples and churches), members are always invited to come to the temple whenever they wish to meditate, study, do prostrations, etc. Back in the 5th century BCE, the Buddha preached regularly the necessity of skillful means on the path to Awakening. Because of the nature of the path, the teachings must meet each person where they are at in their life and must convey the Dharma in a manner from which the person can benefit (it is completely senseless, for instance, to explain the multi-faceted layers of Dependent Arising when a person is struggling with acting toward others out of loving-kindness and compassion). In my culture, to get people to sit in silent meditation for an hour is already a monumental achievement. Therefore, to offer a Sunday service, even if such a practice is not normally followed in Korea, is a skillful means of giving people the opportunity to experience the benefits of Buddhist practice for themselves. Notice that we never change the key practices--meditation, prostrations, chanting, etc. What changes, adapts, evolves, is the means by which we make the practices available to as many people as possible so that they can see for themselves if Buddhist practice fits their disposition in this life. Even if it doesn't right now, they may return to Buddhism later in their lives, recalling their exposure to it. We even have several Christian congregants who have realized the necessity and benefit of regular meditation and, hence, regularly attend our services and trainings. For those who develop greater levels of devotion, the opportunity is there for advanced practices, as have been available in Korea for millenia. In adapting to Western culture in this way, the pioneer monks who brought Buddhism to the West performed the most skillful, and most compassionate, act possible. Just as the Buddha, 2,500 years ago, taught his disciples how they, too, could Awaken fully, these pioneer monks gave us in the West this same gift. The Buddhist approach may not be right for every person in this lifetime, given the innumerable dispositions and attitudes of people today, but I can think of nothing our culture needs more than the message of peace, mindful living, and love taught by the Buddha. Thanks, Jon, for such a thought-provoking question!